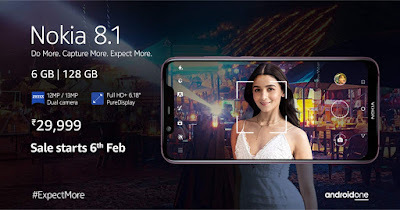 If you have been waiting for HMD Global to launch the 6GB RAM version of the Nokia 8.1 a.k.a. Nokia X7, then you are in luck. The phone has been announced in India and is set to have its first sale in a few days. The Nokia 8.1 6GB RAM version will come with 128GB of storage, double that of the 4GB RAM version. That extra RAM and storage will set you back INR 29,999 (~$420)! The phone will be sold by Amazon India and will be available for purchase on February 6. You can head to the official page to sign up for a notification when it begins. The Nokia 8.1 has a 6.18-inch Full HD+ PureDisplay screen with a notch at the top and support for HDR10. The notch is home to a 20MP 1.4um adaptive selfie camera that boasts impressive low-light performance. The phone is powered by the Snapdragon 710 mobile platform. On its back is a 12MP + 13MP dual camera combo with ZEISS optics. It also has a fingerprint scanner gracing its glass back. The Nokia 8.1 runs Android 9 pie out of the box. It is an Android one phone, so it will get two years of software updates. It is powered by a 3,500mAh battery with support for 18W fast charging.